Russellville High School played its inaugural football game in 1906. The “Athletics” as they were first known were victorious at Morrilton, 7-0. RHS tied their first-ever home game the next week in a return contest with Morrilton, 2-2. 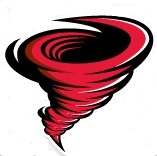 The nickname “Crimson Cyclones” was given to the team by local fans in October of the 1921 season. The team had new crimson uniforms that were bought by a group of local businesses. And it was described that the team “flattened” opponents like a Cyclone allowing just six points in a perfect nine-game season. There were no playoffs at that time, and the Cyclones were passed over as the state champions in 1921. RHS was awarded the honor of State Champions in 1933 after a 10-0 season under legendary coach Wallace Bailey. The Cyclones shut out six opponents and recorded impressive victories over North Little Rock (35-0) and a 27-20 road win over highly regarded Greenville, Mississippi. Russellville won its second State Championship in 2016, defeating Greenwood 37-23 at War Memorial Stadium in Little Rock. The Cyclones tallied their most wins (12) and most points scored (458) in a single season in their history. The first major athletic event in Cyclone Stadium was the Arkansas High School Girls State Pentathlon in May 1982. Russellville’s own Belinda Abernathy was the winner of this event. 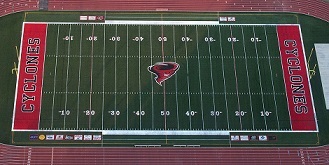 Cyclone Stadium has been the site of numerous football games, conference, and state championship track and field meets, high school soccer, and the Meet of Champs. In addition, two NAIA National boys’ cross country and track teams became the first high school in Arkansas to take the Triple Crown by winning State Championships in cross country, indoor track and outdoor track and field. In 2008, Cyclone track was named “Don Carnahan Track” in honor of the longtime football, cross country, and track and field coach. Football was first played at Cyclone Stadium 1983 when RHS defeated Van Buren 35-0. The junior high did not play at Cyclone Stadium until the middle of the 1986 season when a storm-damaged visitors’ stands at Bailey Field. There have been numerous changes to the stadium. Construction of the premier track and field/football field combination of the day began in1996, the construction of Cyclone Hill by the Football Booster Club in 1997, the building of the current field house by football boosters in 2000, new ticket booths and the exterior fence in 2007, and artificial turf in 2010. A new scoreboard was installed in 2013, and a shot and discus area with lighting along with a new pole vault area was constructed in 2014.